Top: Mike Madsen, who had five goals in Locust Valley’s upset win over Port Washington. Above, twin brother Joe Madsen. It didn’t take long for there to be a major upset in the nation’s No. 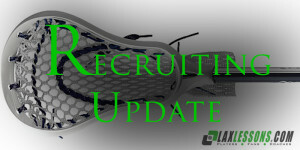 1 hotspot for lacrosse, the NY/NJ/CT tristate region. It happened on Wednesday as Locust Valley, coming off a 6-11 record in 2013, beat 2013 Nassau County finalist Port Washington 10-9. St. John’s-bound sophomore Mike Madsen finished with five goals and an assist. Madsen’s twin brother, Joe Madsen, had one goal. “Starting off the season with a win against a high ranked Class A school gives us the confidence to succeed and do great things this year,” Joe said. “Our win was an overall team effort while both our offense and defense played great. The Falcons’ assistant coach, Mike Gallagher, is a teacher at Port Washington. “Ever since he started here, he wanted to beat Port Washington, but had never done so until now,” Mike Madsen said. “He was extremely proud of us and what we accomplished. The Madsens are looking forward to getting more big wins at the next level. The twins verbally committed to St. John’s University, as reported by Joe Lombardi on LaxLessons.com Lacrosse Insider premium coverage section. Joe, who was also recruited by Cornell, UPenn, Georgetown, Dartmouth, Binghamton and Albany, is 5-foot-6, 130 pounds. Mike is 5-foot-7, 132 pounds. Joe is a righty, Mike is a lefty. You can watch Joe’s highlight reel here. You can watch Mike’s highlight reel here. Now, let’s hear from Joe and Mike on their commitments. Joe: First, the proximity of the campus to Manhattan and the city environment. (St. John’s Head) Coach (Jason) Miller and (Assistant) Coach (Dan) Paccione’s vision for the lacrosse program and the fact that Coach Miller and Coach Paccione made me feel very comfortable. I look forward to playing for Coach Miller and Coach Paccione. The fact my brother and I get to play together. Also, the academic options offered. I plan on studying business and accounting. Mike: I like the environment of the campus being just outside Manhattan. The coaches also made me feel comfortable. I get to play with my twin brother, which is a plus because we have had a natural chemistry on and off of the field our entire lives. I plan on studying business at St. John’s and look forward to playing for Coach Miller and Coach Paccione. I love the city, the program, the coaches, and the school, so this is definitely the place for me. Joe: In first grade, another set of twins that Mike and I are good friends with invited us over one day to throw around with lacrosse sticks. Their father, seeing that we were good baseball players/athletes, wanted us to pick up the sticks and see how we liked it. We loved it from there on out. My brother and I have been playing together ever since. My brother and I played travel hockey and played basketball. Joe and Mike: We greatly appreciate the time and effort of our varsity coach at Locust Valley High School, Matt McFarland. Matt McFarland is not only a great coach, but a great friend and mentor. I also want to thank my box coaches, Brian O’Keefe and Pat McCabe.